through Many Lifetimes and The Box of Daughter. 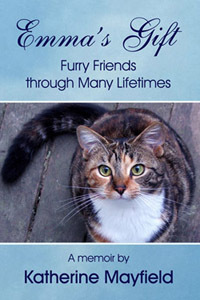 Her latest memoir, Emma's Gift: Furry Friends through Many Lifetimes, tells the story of the author's rescue of an abandoned kitty who launched her on a journey of self-discovery and a search for a closer relationship with God and the Universe, and brought her to the realization that our pets can reincarnate to be with us again and again. who has ever had a special cat in their life." Ms. Mayfield began writing books on coping with bullying and dysfunctional family dynamics after she published her first memoir, The Box of Daughter, and discovered that many people who have dysfunctional family issues believe that other families are functional, and often suffer from low self-esteem because they think the problems in their families are "their fault." In fact, most people's families are dysfunctional in one way or another, and the effects of trying to cope with critical family members and family bullies can deeply affect a person's life on every level. Ms. Mayfield's nonfiction books stress the fact that people can truly recover from family bullying and traumas caused by dysfunctional family dynamics, so that they can begin to live authentically, and create the lives they want to live. Creativity is her favorite pastime. She's passionate about writing, music, cats, and pickleball. In her "other life," she's a professional pianist. and receive a free book excerpt! Laugh your way to happiness! All information on this website Copyright 2019 Katherine Mayfield. All rights reserved. This site includes information on the subject of bullying and emotional abuse. Information represents one writer's point of view, is for general purposes only, and is not to be construed in any way as professional counseling or mental health advice.